Planet Hollywood Resort & Casino has debuted Café Hollywood, as the hotel marks its 10-year anniversary. Located on the main casino floor, the 5,500-square-foot restaurant focuses on all things Hollywood, with a photo gallery and multimedia celebration featuring highlights of Planet Hollywood’s 25-year history and of entertainment moments interspersed among the video content broadcast on the Café’s 35 monitors. The menu includes cinnamon roll french toast, poke nachos, a grilled macaroni and cheese sandwich and pork belly ramen. The wine bar and lounge offers more than 40 different wine varietals, 24 of them by the glass, as well as a full bar and small plates. A full array of breakfast goodies, coffee drinks, gelato and decadent desserts is available at a pastry shop. Café Hollywood, Planet Hollywood Resort & Casino, 3667 Las Vegas Blvd. S., Las Vegas, NV 89109, 702-732-1222. Osteria Costa has debuted at The Mirage in the former space of Samba Brazilian Steakhouse, which closed August 31. The new Italian eatery replaces Portofino, which closed around the beginning of the new year. The design exudes the Amalfi Coast, and the colors of seaside blues and greens dotted by lush greenery and light wood furnishings convey an Italian coastal theme. The dining room has a canopy of linen and chandeliers that look like umbrellas. Expect a menu of Neapolitan pizzas, handmade pastas, fresh seafood and house-baked bread; the bar program features house-made limoncello, cocktails and wines by the glass. Osteria Costa, The Mirage, 3400 Las Vegas Blvd. S., Las Vegas, NV 89109, 702-692-8482, 800-627-6667. Tropicana Las Vegas has unveiled its new Savor, the Buffet. Set in the space of the former Beach Café, the 5,384-square-foot all-you-can-eat restaurant features four live action stations with cuisines including American, Asian, Italian and Mexican and showcasing fresh, made-to-order pizza and pasta. Highlights include dishes such as a BLT Benedict, chicken scaloppini with prosciutto and white beans, and green chile enchiladas. Savor, the Buffet, Tropicana Las Vegas, 3801 Las Vegas Blvd. S., Las Vegas, NV 89109, no phone. MB Steak at Hard Rock Hotel & Casino will welcome rodeo fans with a bourbon flight throughout the National Finals Rodeo (NFR) from Thursday, Dec. 7 to Saturday, Dec. 16. Dubbed the “Bourbon Cowboy” and priced at $29, the flight will include one-ounce pours of Angel’s Envy, Four Roses Single Barrel and Old Forester. Executive chef Patrick Munster suggests pairing the Bourbon Cowboy flight with the restaurant’s 28-ounce dry-aged tomahawk steak, prepared with roasted chili rub. MB Steak, Hard Rock Hotel & Casino, 4455 Paradise Rd., Las Vegas, NV 89169, 702-483-4888. Twin Creeks Steakhouse at Silverton Casino Hotel will offer a three-course cowboy meal deal priced at $50 during the National Finals Rodeo. The special, available Dec. 7-10 and Dec. 13-16, will include campfire bacon-wrapped shrimp with chipotle BBQ sauce and corn pudding; bourbon braised lamb shank with smoky white bean ragoût and fried Tabasco onions; and a sweet banana pudding jar with maple cream and streusel crumble. In addition, every Friday in December the Steakhouse will offer a house salad, six-ounce filet mignon, baked potato, dessert selection and a glass of wine for $50 per person. Twin Creeks Steakhouse, Silverton Casino Hotel, 3333 Blue Diamond Rd., Las Vegas, NV 89139, 702-914-8594, 866-946-4373. Chef Shawn McClain’s Sage at Aria Resort & Casino is offering a free bottle of Veuve Clicquot Champagne to guests when they use social media to hashtag or tag the restaurant while dining at the restaurant. The deal is being offered nightly through the end of 2017. Sage, Aria Resort & Casino, CityCenter, 3730 Las Vegas Blvd. S., Las Vegas, NV 89109, 877-230-2742. In addition to its daily happy hour from 4:30 p.m. to 6:30 p.m. featuring half-off starters, $5 Bandito Margaritas and $5 draft beer, Bandito Latin Kitchen & Cantina is now offering all-day-long specials for nearly every day of the week. Specials are Monday: $5 Bandito and Sandia Margaritas; Tuesday: two-for-one taco platters; Wednesday: half-off bottles of wine; Thursday: half-off drinks for industry pros; and Saturday and Sunday: extended happy hour pricing from 11:30 a.m. to 6:30 p.m. Bandito Latin Kitchen & Cantina, Hughes Center, 325 Hughes Center Dr., Ste. 100, Las Vegas, NV 89169, 702-857-7550. Some switcheroos are taking place at Wynn Las Vegas and Encore Las Vegas. After The Country Club closes on January 14 in preparation for the resort’s construction of its $1.5 billion 140-acre Paradise Park manmade lagoon and water sports facility, executive chef Rene Lenger will move over to take the same position at Tableau. David Middleton will leave his executive chef role at Tableau to take on the chef de cuisine title at Lakeside under David Walzog. Over on the Encore side of the resort, Theo Schoenegger, who had helmed Sinatra for the past eight years, departed after December 1 and handed the reins over to Luke Palladino, the former executive chef of Salute Trattoria Italiana at Red Rock Casino, Resort & Spa, which closed in early December. It has not been announced where Schoenegger is headed next. Wynn Las Vegas, 3131 Las Vegas Blvd. S., Las Vegas, NV 89109, 702-770-7000, 1-888-320-WYNN. After 16 years at Palms, Alizé at the Top of the Palms, the French restaurant founded by chef André Rochat, will close after service on New Year’s Eve. Rochat’s Andre’s at the Monte Carlo closed in October of 2016 as part of the resort’s transition into Park MGM and to make way for Eataly. Andre’s Bistro & Bar at Fort Apache Rd. and Patrick Ln. will remain open. 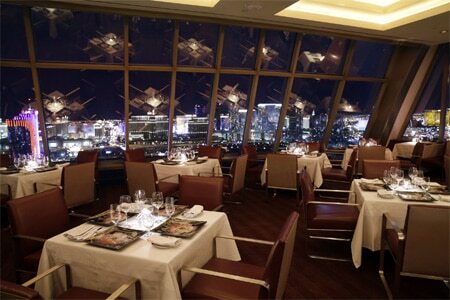 Alizé at the Top of the Palms, Palms Casino Resort, 4321 W. Flamingo Rd., Las Vegas, NV 89103, 702-951-7000. Four more restaurant closings took place at Monte Carlo Resort & Casino as it transitions into Park MGM and NoMad Las Vegas. Adding to the list of closures are Diablo’s Cantina, Sambalatte, 800 Degrees (which will soon relocate to New York-New York Hotel & Casino) and Minus5 Ice Bar. There are now only three dining options currently still open on property: Double Barrel Roadhouse and the newly-launched Primrose for breakfast, lunch and dinner and Bavette’s Steakhouse & Bar. These and the previous closings of Andre’s, d.vino Italian Food & Wine Bar, Dragon Noodle Co. & Sushi Bar, The Buffet at Monte Carlo, BLVD Creamery, Starbucks, Manchu Wok, Subway, Rubio's, Sbarro's, Johnny Rockets and Original Chicken Tender are to make room for the substantial Eataly project from Mario Batali and Joe Bastianich opening in 2018, which will feature a 40,000-square-foot European-inspired food hall. Monte Carlo Resort & Casino, 3770 Las Vegas Blvd. S., Las Vegas, NV 89109, 702-730-7777, 888-529-4828.